Stay safe and have fun by following our simple instructions for looking at the eclipse through a home-made camera obscura. By now, most people know that looking directly at Sunday’s partial eclipse could cause severe eye damage. If you don’t have extremely dark sunglasses made specifically for looking at the sun, experts recommend looking at the event through a so-called camera obscura, or pinhole camera. 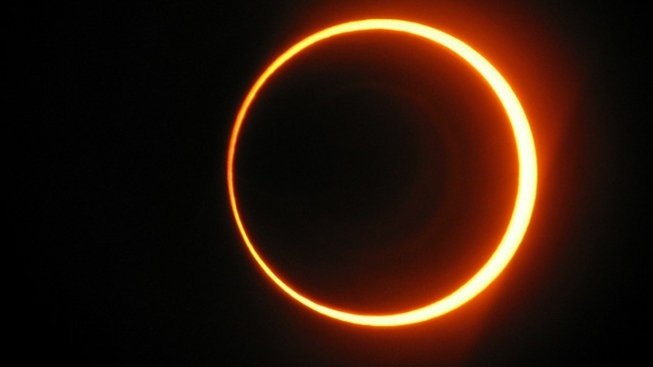 Related:Find out more about this "ring of fire" eclipse. But what is that? And how do you make one? A pinhole camera is basically a way of reflecting the sun’s light on to a white piece of paper (or other screen) in order to see it without damage. The simplest way to make one, according to instructions from NASA, is to use two pieces of stiff white paper, such as poster board. Poke a hole in one of the pieces of paper. Make sure to look the other way yourself, but hold the paper with the pinhole up to the sun. Let the light come through the pinhole. Related: "Transit of Venus, Viewed Safely"
Position another piece of paper so that the light coming through the pinhole is shining on that second piece. The image will be a reflection of the eclipse. You might have to move the first and second pieces of paper around a little bit to get the picture in focus, and to make your image larger. You can make a more elaborate camera by following these instructions from Kodak. This process of painting a tin can black and using real film might be too time-consuming to complete in advance of the eclipse, but it could be a fun project down the road. The eclipse will begin to be visible in Los Angeles at 5:24 p.m., and last until 7:42 p.m.